Develops strong cross-functional collaboration among stakeholders. While many enterprises have established CoEs to overcome challenges and accelerate their automation journeys, not all have been able to extract value from them. Here are some common pitfalls that limit the true potential of an automation CoE. Automation CoEs work when there is a clear mandate from enterprise leadership. This directive helps ensure that the operating procedures and governance mechanisms are standard across the enterprise. Lack of it could result in the enterprise driving automation initiatives in pockets, leading to potential cost increases, lower license utilization, lower reusability of automation assets, and increased governance challenges. In its true sense, a CoE represents an entity with the capability to drive automation initiatives across the enterprise independently, with minimum oversight from outside. In many enterprises, however, automation CoEs lack the relevant skill sets – such as developers, project managers, solution architects, and infrastructure support staff – that are critical to driving these initiatives. Successful CoEs typically have three focus areas: day-to-day delivery, operational/tactical decision making, and strategic decision making/providing direction. Each layer, or focus area, has a unique set of roles and responsibilities that are critical to a smooth functioning CoE. Successful CoEs have an intentional focus on developing and nurturing in-house talent to strengthen the capabilities across the three layers. Many CoEs also bring in third-party specialists to accelerate learning. Our blog titled Driving Success in Your Automation Center of Excellence provides more details. The role of an automation CoE goes beyond just deploying bots into production. CoEs in best-in-class adopters of automation have evolved from executing solutions to empowering businesses across locations to drive initiatives on their own. For instance, the automation CoE in a financial services firm has established standard operating procedures (SOPs) for driving automation initiatives which include a well-defined approach for process selection, evaluation of ROI, talent impact, access to a library of reusable assets, etc. The CoE has created a platform through which business leaders can access these SOPs to evaluate opportunities on their own, and provides necessary governance and execution support, including talent and infrastructure. Tracking success/outcomes in collaboration with operational teams so they can build, review, and refine the business case for scaling up. Outcomes achieved through automation initiatives are best realized when these investments are in line with the enterprise’s broader digital transformation objectives. Factors such as investments in other digital technologies (e.g., ERP transformation), changes in leverage of Global In-house Centers (GICs) or shared service centers, changes in vendor roles, etc., can have an impact on automation strategy. Automation CoEs need to closely align with enterprise strategy to realize maximum value. 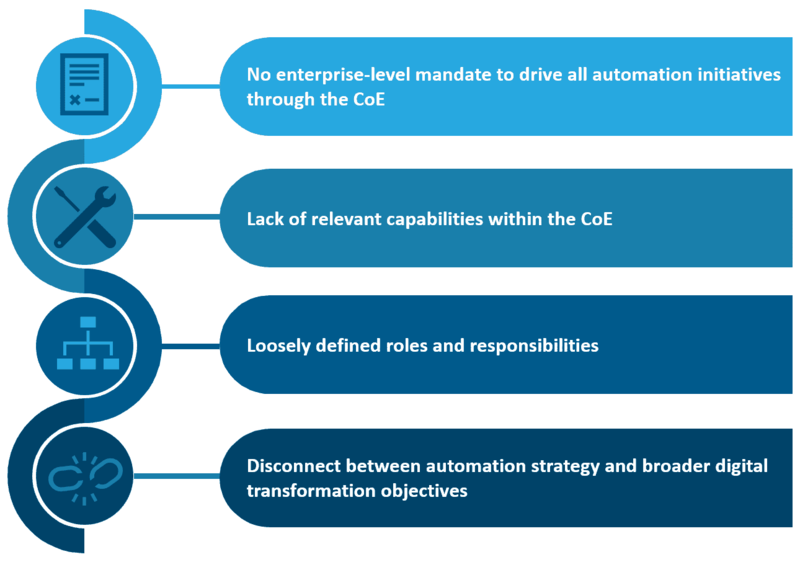 Pinnacle EnterprisesTM – which we define as companies that are achieving superior business outcomes because of their advanced capabilities – have mastered each of these four requirements for successful automation CoEs. To learn more about how they’re maximizing value from their automation CoEs, please see our Enterprise RPA Pinnacle report. Feel free to share your opinions and stories on how your automation CoE is evolving in its journey directly with me at [email protected]. Advances in new digital technologies, the emergence of new competitors, new sourcing models, and changing customer expectations are dramatically changing the type of IT skills enterprises across industry verticals require. And, with new service delivery paradigms such as automation, agile, and Artificial Intelligence (AI) becoming mainstream, the underlying service delivery models to support the new talent demand profile are also undergoing significant changes. We expect technology themes such as data management and analytics, omnichannel customer experience, and cloud adoption to dominate near-term demand, and cybersecurity, Service Oriented Architecture (SOA)-based application design, and agile delivery methodologies to become mainstream. So, what does this mean from a talent perspective? Below are four takeaways from Everest Group’s recent research, much of which is detailed in a newly-released viewpoint titled Closing the Gap – The Future of IT Skills in the United States. Automation architects and Machine Learning (ML) experts to develop automated scripts. The technology revolution is leading to an integrated “thin slice” architecture that is enabled to deliver end-to-end experience transformation. This full-stack structure is a sharp deviation from the legacy silo-based architecture that has fundamentally different attributes for delivery of technology services in enterprises. From a talent perspective, traditional siloed factory models are evolving into smaller teams/pods with capabilities cutting across areas such as application development, infrastructure support, and security. Demand for full-stack engineers will increase significantly as the demand for this future integrated stack becomes more prominent across enterprises. Enterprises will need to invest in upskilling and cross-skilling their existing talent at scale and speed to be able to pivot to this new model. Emerging technology themes will increase demand for some tech skills, and reduce demand for others. For instance, we expect demand for emerging skills such as Go and R programming to increase considerably, as enterprises explore the adoption of big data and AI solutions. On the other hand, we expect demand for skills specific to middleware tools, such as TIBCO, to remain low-medium, driven by increased adoption of offshoring and automation. Enterprises must have a good understanding of hard-to-hire skills in order to effectively chart out their talent roadmap. Key decisions such as local hiring versus offshoring will also revolve around expected demand and supply for skills. To learn more about the emerging technology themes, their impact on talent requirements, the skills we expect to gain importance in the future, and their supply outlook, please read our viewpoint on skills of the future in the U.S. And feel free to share your opinions and stories on how you are managing tech-talent directly with us at [email protected] or [email protected]. The rise of India-based Global In-house Centers’ (GIC) role in supporting enterprises’ digital transformation through digital technologies, such as RPA, mobility, and IoT, has been significant in the past few years. In 2017 alone, over 50 percent of the GIC set-ups in India were focused on building/enhancing enterprises’ digital capabilities. Indeed, enterprises are making their India GICs the hub for developing solutions and products for next-gen technologies, such as machine learning, NLP, predictive learning, cognitive, and blockchain. Recent examples include Samsung, State Street, and Western Union. How are the best-of-the-best enterprises and GICs leveraging India and other locations for digital? To expand our insights beyond the work we conduct with our clients, we’ve launched a Digital Pinnacle™ survey to learn more about successful GICs’ digital journeys. We invite you to participate in the survey and/or to share your thoughts and experiences with us at [email protected] or [email protected]. Watch this space for more insights on GICs and for the deep-dive survey results. Enterprises are increasingly leveraging their Global In-house Centers (GICs) to drive automation efforts across the globe. Per recent interactions with over 100 enterprises, GICs, and technology vendors to develop our new report, “RPA Implementation in GICs – Learnings and Best Practices,” we determined that more than 50 percent of enterprises are already driving or plan to drive their global RPA initiatives from Centers of Excellence in offshore/nearshore GICs. While GICs are well positioned to drive RPA, the extent of success varies and the journey is not easy. To succeed, GICs need to avoid the following six pitfalls, and follow the lead of best-in-class GIC adopters of RPA. Successful RPA initiatives are a result of strong collaboration between enterprise and GIC leadership. Best-in-class GICs involve enterprise leadership from the beginning of their RPA journey. Successful RPA initiatives involve stakeholders from relevant functions – e.g., IT, operations, risk, and legal – not just the operations team (recipients of automation solutions.) RPA initiatives in some organizations reside under the strategy and innovation function, rather than being led by IT or operations. Through centralized efforts, GICs are able to document and share knowledge across the enterprise, thereby, reducing cost, effort, and time to implementation. Best-in-class adopters have a strong emphasis on developing in-house capabilities, for example, product development / customizing RPA solutions to suit process requirements. Successful GICs have avoided the temptation to automate high complexity processes or explore end-to-end automation, and instead have focused on transactional/repetitive/rule-based processes that are easier to implement. Successful GICs view RPA as one of the tools to improve operations by way of error reduction, productivity enhancement, and SLA compliance improvement. Process standardization and reengineering both play key roles in driving the effectiveness of RPA solutions. Best-in-class GICs have evolved from execution to enabling business units across multiple locations to implement RPA solutions independently. To learn more about the best practices employed by mature GIC adopters of RPA, read our report, “RPA Implementation in GICs – Learnings and Best Practices.” And if you are driving RPA from your GIC, we’d love to hear your story. Feel free to share your opinions and stories on how your GIC is evolving in its RPA journey with [email protected] or [email protected]. Also, keep a lookout for our upcoming report on Enterprise RPA adoption, which leverages our robust Pinnacle Model™ methodology to compare enterprise performance on RPA adoption. Finally, we’re in the process of conducting a first-of-its-kind survey, the results of which will reveal the state of digital adoption and what separates Pinnacle GICs™ from others. We invite you to join your peers and participate in this survey, today! The shift towards a “digital-first model,” in the wake of technology-led disruption, has given GICs an opportunity to become strategic entities that can drive innovation across the enterprise, instead of an arbitrage-first-oriented low-cost set-up delivering back- / middle- office services at scale. A very positive move for GICs and the enterprises they support. Robotic Process Automation (RPA), among other digital technologies, is gaining popularity across enterprises and GICs thanks to its many business benefits. And enterprises are increasingly leveraging their GICs to drive RPA usage. This is largely driven by factors such as GICs’ tighter integration with the core business, increased endorsement from the enterprise, shift toward insourcing, higher visibility to enterprise leadership, lower costs, and availability of talent. Successful GICs, through dedicated RPA CoEs, have gone beyond exploring RPA technology for in-house consumption. From educating various stakeholders across the enterprise on capabilities and benefits of the technology, to executing RPA solutions across functions and locations, these CoEs are playing a key role in transforming processes across the enterprise. CoEs in best-in-class GICs have gone a notch higher, and are focusing on creating an ecosystem that enables businesses to independently explore RPA opportunities. While GICs are well positioned to drive RPA across the enterprise, successful implementation requires dedicated focus on factors including governance and business continuity. They must also be on the lookout for advanced technologies, such as AI and cognitive, that can augment existing RPA technology and enhance overall automation business benefits. To learn more about the best practices employed by best-in-class GIC adopters of RPA, please read our recently published report, “RPA Implementation in GICs – Learnings and Best Practices.” We developed it based on interactions with 100+ global enterprises’ GICs and a range of automation technology vendors. If you are driving RPA from your GIC, I’d love to hear your story. Feel free to share your opinions and stories on how your GIC is evolving in its RPA journey directly with me at [email protected]. And/or, join in on our research on how enterprises design their GIC journeys to drive their enterprises’ digital agendas. Click here to take the survey; responses will, of course, remain anonymous.